Conceived of by Bill "MrExcel" Jelen, MrExcel Labs is the logical 'next step' from the core 'Learn Excel from MrExcel' book and seminar experience. By building upon the foundations created in the 'Learn Excel from MrExcel Video Podcasts' series, Bill has begun to develop -and make available- a number of uniquely qualified, useful products geared toward making your experiences using and learning Microsoft Excel Easier, Efficient and More Effective. 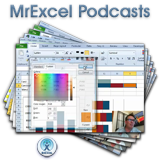 MrExcel Labs is an amalgamation of "...great ideas and improvements come to life" for Microsoft Excel Users. MrExcel Labs is committed to creating -and making available- Quality, Field-Tested Excel products that provide instant ROI. Products are tested thoroughly in their intended environs before release to the general public - MrExcel Labs Products can be acquired and used with confidence!